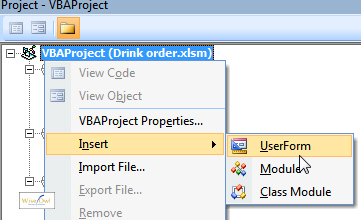 Right-click in a project/workbook and choose the option shown to insert a user form. Click and drag on the bottom right corner to resize a user form - it will always appear at the top left corner of the code editor window. 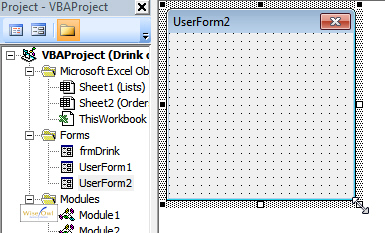 Just like macros, a user form is stored as part of a workbook, rather than in a separate file. 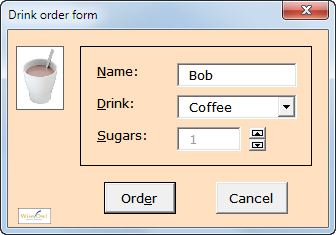 This form has 1 label, 1 textbox and 1 command button. A later blog in this series shows how to add some of the more esoteric controls - for now, we'll stick to general principles. The form Toolbox - the simplest controls are shown at the top left. Click on the tool shown to display the Toolbox, if it's gone AWOL. 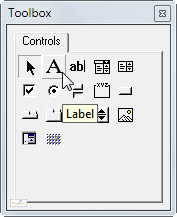 Here the mouse pointer shows that you are drawing a Label control. It's often easier just to click where you want a control to go, and Excel (or any other application) will draw it with a standard size and shape. Having learnt how to draw controls, let's move on to how to show their properties.